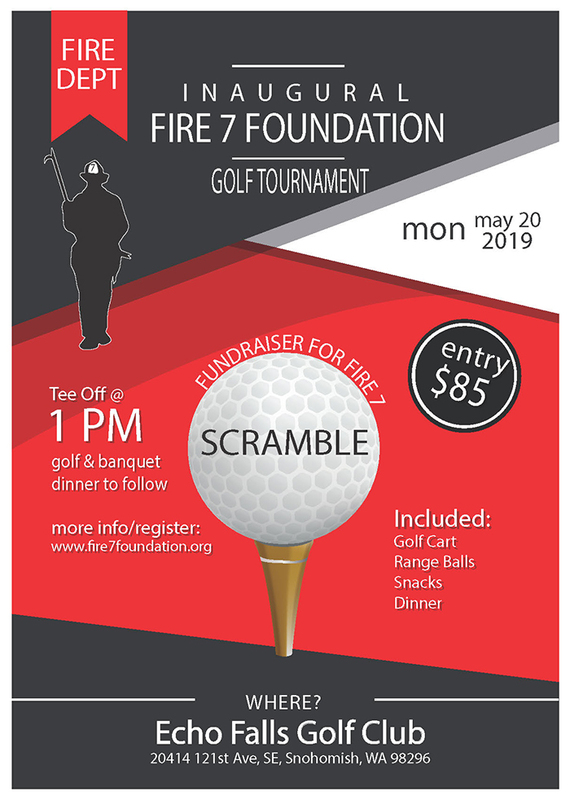 Snohomish County's non-profit Fire 7 Foundation is holding their first annual golf tournament fundraiser at Echo Falls Golf Club on Monday, May 20, 2019. The purpose of this tournament is to raise money and awareness of the Fire 7 Foundation. The foundation's mission is to support the local community and fire service families during times of need. The Fire 7 Foundation provides for our community by assisting with programs that support the ongoing health, safety, and education of firefighters and the community they serve. Some recent programs include holiday gift-giving, financial assistance to a local adolescent shoe giveaway, and financial support of the community CPR program. The Fire 7 Foundation Golf Tournament is open to the public and they are looking for more golfers to sign up. Click on this link to find out more and to sign up for the tournament: Fire 7 Foundation website. As well, the Fire 7 Foundation is looking for tournament sponsors. Since the organization is a registered 501(c)(3) non-profit, donations may be tax deductible. If you have any questions about sponsorship, please contact Tournament Director Tyler Compton at tcompton@snofire7.org or by phone at 360-927-0513.